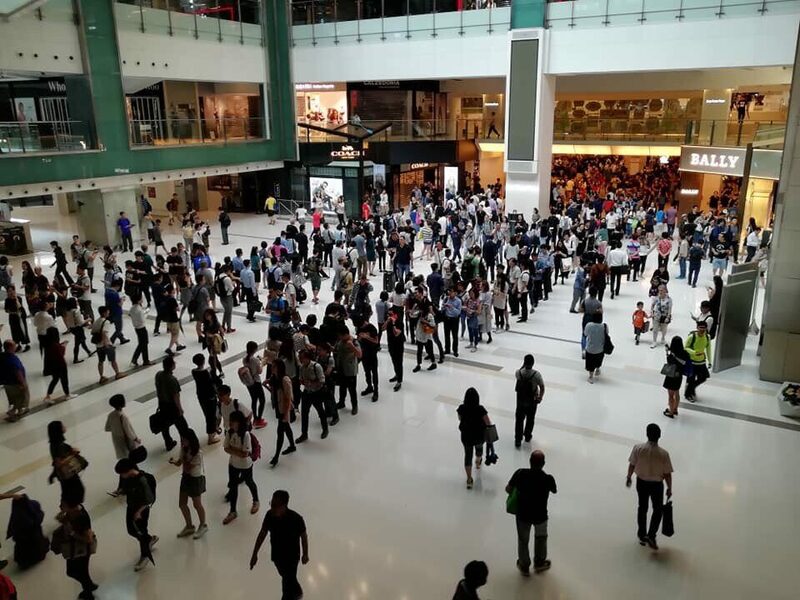 Huge crowds formed at several of Hong Kong’s transport hubs as residents returned to work after typhoon Mangkhut forced the suspension of public services. 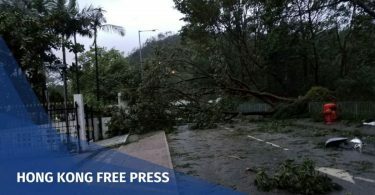 Chief Executive Carrie Lam said the storm was the strongest since the Observatory’s record-keeping began, as the strongest typhoon signal was hoisted for over ten hours. The government ordered the suspension of classes, but did not suspend work for the public. Shenzhen and Guangzhou – mainland cities also affected by the storm – ordered the suspension of both, as well as business closures. 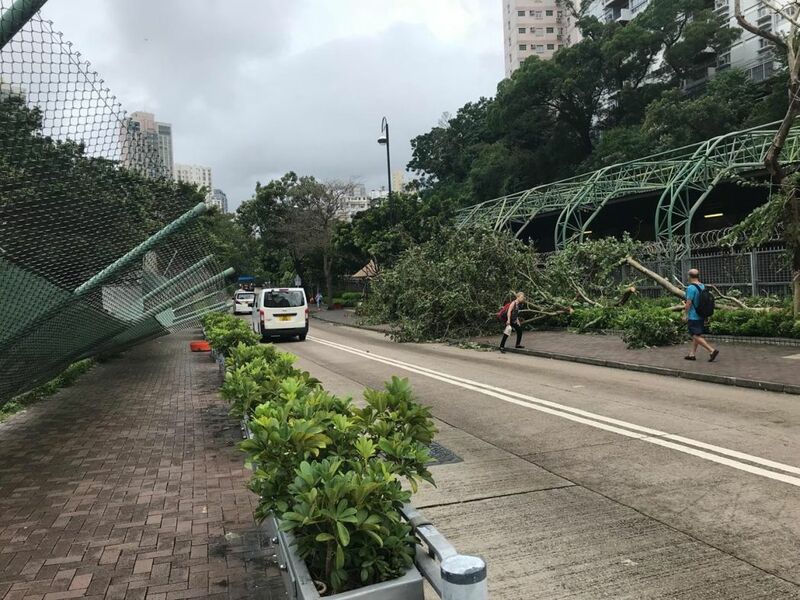 On Monday morning, bus services on some routes remained suspended owing to fallen trees on the roads, while many rail routes were suspended as well. 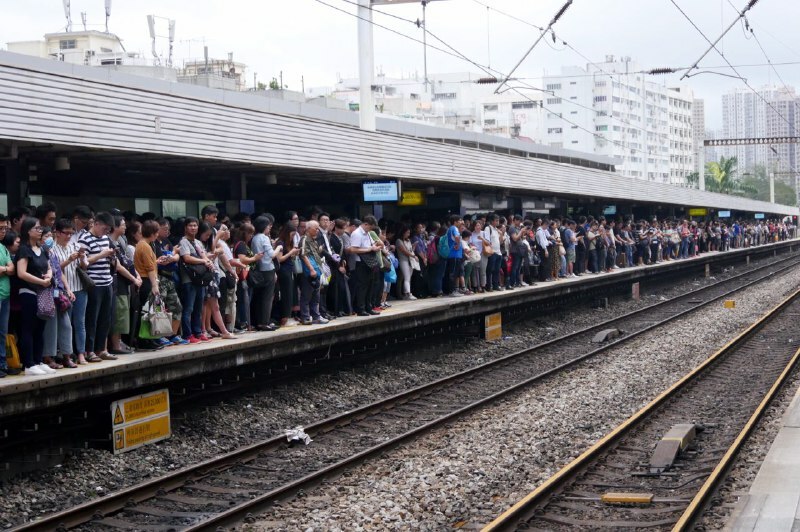 Service was suspended on the East Rail Line between Sheung Shui and Tai Po Market, while trains at other stations ran at 10-15 minute intervals. Commuters waited in long queues for connecting bus services in the morning. At Tai Wai station – which connects the Ma On Shan line and the East Rail Line – hundreds were queuing in line to catch a train by 7am. 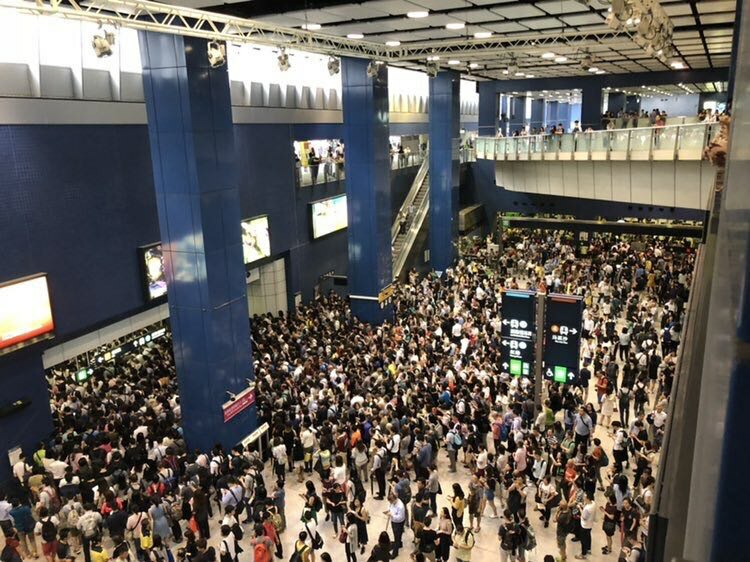 Trains to Hung Hom station on the East Rail Line were suspended due to typhoon damage. Commuters line the platform at Tai Wai Station. Photo: HKFP/Jennifer Creery. At 10am, crowds had formed around the station entrance as staff closed off access to the train platform to avoid overcrowding. Some passengers were visibly frustrated as staff directed the flow of people away from the platform. 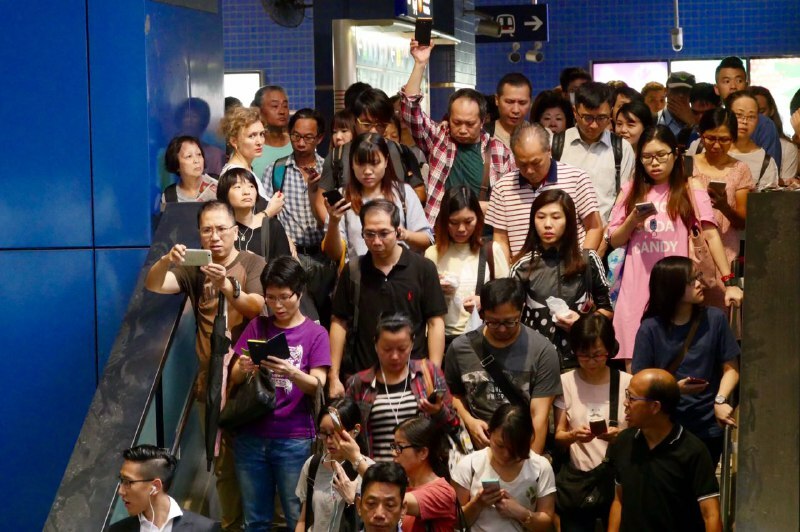 Waiting passengers lined the station walls, as some cancelled plans on Hong Kong island. Commissioner for Transport Mable Chan urged passengers to be patient and reserve more time for their commute. She said there were electricity issues at the Tai Wai station, causing a long queue towards Kowloon Tong. “I urge members of the public to remain patient – we will stay in close contact with the MTR Corporation and bus companies,” she said. 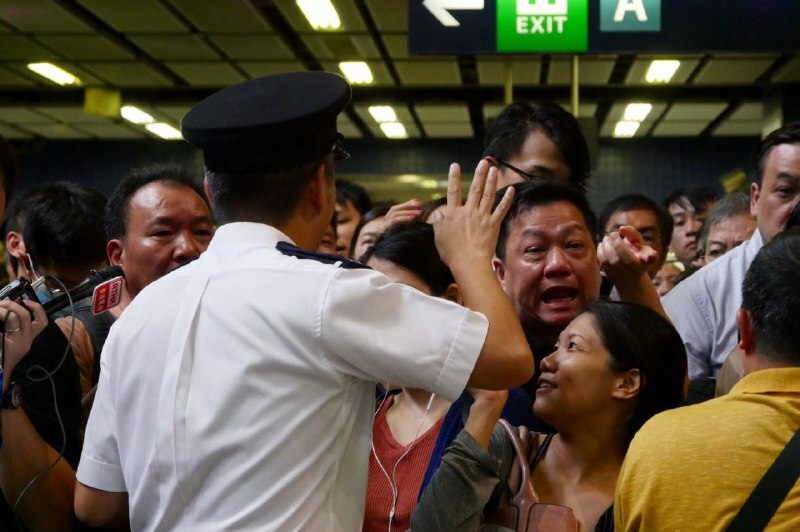 At 10am, people were lining up to enter Shatin station, as the platforms were overflowing. Chan said some 600 roads were blocked by trees or other objects, while 30 main roads have been cleared. She added that one to two outlying piers were being repaired. 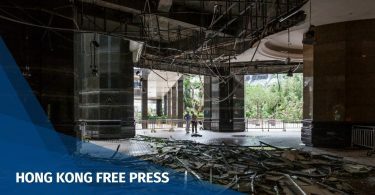 “We will continue to follow up with the Highways Department and operators to conduct emergency repairs and clean-ups,” she said. Secretary for Security John Lee said that there were some 1,500 reports of fallen trees – more than double the number reported during typhoon Hato last year. Scenes near Oi Man Estate. Photo: Handout. There were also nine reports of severe flooding, double the number reported under Hato. Reports of broken windows – up to 500 – were triple the number reported during Hato. Lee said 394 were injured – 3.5 times the number caused by Hato. 1,500 residents were moved to temporary shelters. The police received some 20,000 calls for help – around four times more than normal. 175 remain hospitalised.